Cookies are nice. Cake is good. So is ice cream. But sometimes I want something really rich and intense, where only a small piece is enough to satisfy my craving. 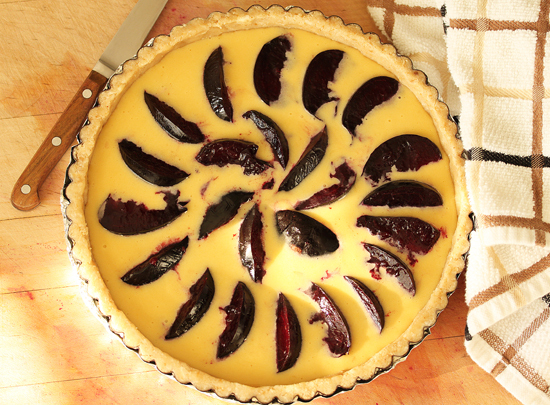 Well, this plum tart is the perfect antidote. 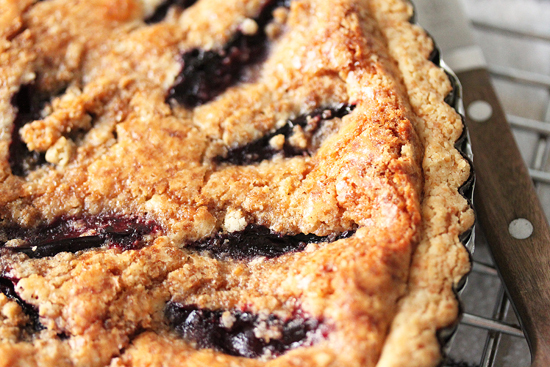 A buttery crust, rich custard, intensely sweet fruit and crunchy brown sugar crumb topping. Oh yes. This is the one. The dough is processed until it looks like meal. Then it is pressed into the bottom and sides of the tart pan. This is an opportunity for OCD me to make it as perfect as possible. So satisfying. 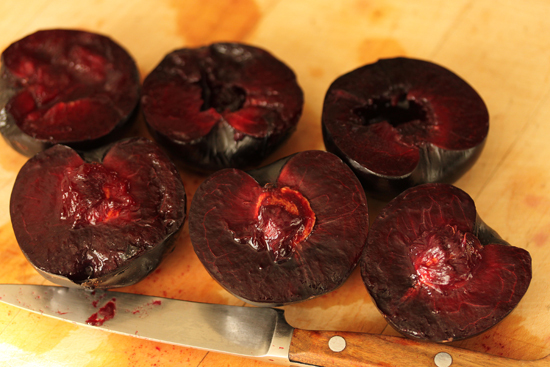 These are the Black Plums I bought at the Farmers Market a couple of weeks ago. I got them at the same time as the beets for the Beet, Red Cabbage and Carrot Salad, the green tomatoes for the Fried Green Tomatoes with Tomato Chutney and the eggplant I grilled on the Fourth of July. I had never seen plums with such a deep rich purple color and I had to buy them. Had to. The plums are cut in wedges and arranged in a nice pattern. You can make up your own pattern. Or just dump them in and make sure they’re evenly distributed. Then the crumb mixture is sprinkled on top. While it is baking, the whole house fills up with this incredible smell of ginger from the crust. Then it comes out of the oven and the way it smells is so divine. Buttery. Plum-y. Ginger-y. You will have to restrain yourself from cutting into it until is has cooled down to just warm. You can eat it with vanilla ice cream or whipped cream, maybe garnished with a little mint sprig for beauty. But I like mine pristine, so I can savor each bite. Those plums were amazing. Note: An equal amount of peaches or pears can be used instead of the plums. Both are wonderful. 2. 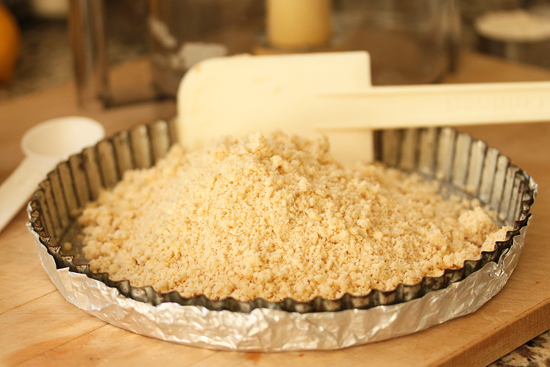 Cover the outside of a 9-inch tart pan (with removable bottom) with foil. Place in the freezer for 30 minutes. Remove from freezer and brush the inside with melted butter. Return to freezer. 3. Place the flour, butter, cream, 1 tablespoon brown sugar, spices and salt in bowl of food processor. Process until it resembles course meal, about 30 seconds. 4. Transfer ½ cup of this mixture to a separate bowl and stir in the additional 2 tablespoons of brown sugar. Set aside. 5. 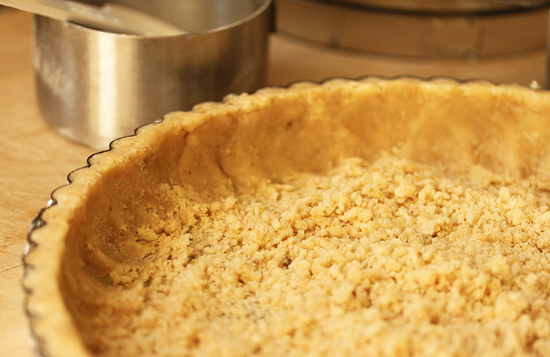 Press the remaining dough mixture into the bottom and sides of tart pan. This may take a little bit of time, but persevere. Bake in the center of 375 degree oven for 20 minutes or until lightly browned. 6. 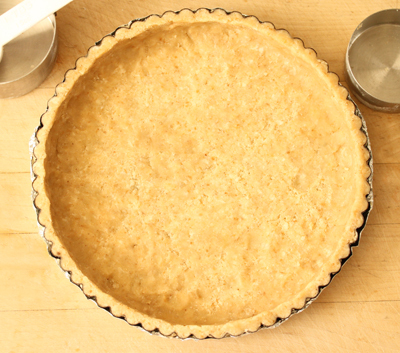 Remove tart shell from oven and reduce temperature to 350 degrees F.
7. Prepare filling: Using steel blade in processor, combine sugar, cream, flour, yolks, lemon juice and vanilla. Process for 30 seconds, stopping once to scrape down sides of bowl. Pour into baked crust. 8. Arrange sliced fruit on top of filling in a pattern. Sprinkle with reserved crumb mixture. 9. Place on a cookie sheet and bake at 350 degrees until custard is set, 40-50 minutes. Allow to stand until warm before removing from pan. 10. Serve warm or at room temperature. If desired, garnish with whipped cream and fresh mint. i love the way you talk about food… very seductive if i might say so. i know your language, i’m easily wooed by sweet tarts too. This looks delectable. I’ve been looking forward to plum season for quite some time and this looks like a great way to celebrate it. Thank you for sharing such a delectable treat! I hope you had a great Monday, my friend, and I hope you have an even better week. Hugs from Austin. Mm I love a good tart! My old roommate had a pan, I used to borrow all the time–but for quiche! 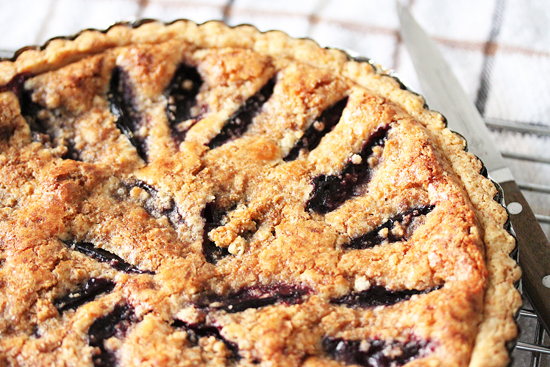 Tarts are definitely on my to-cook list though, and I do love them! Where have I been! 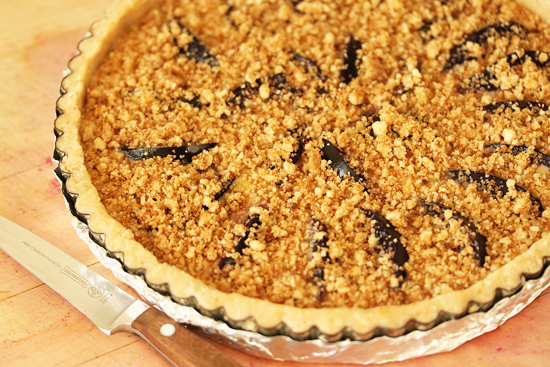 This looks utterly, completely scrumptious and I like your method for making the tart shell. Could I pull this off with apples, do you think? I made this yesterday and it came out great! The crust is wonderful- very easy technique with a sturdy but tender crumb. The filling blends really well with the fruit, so you almost can’t say there is anything there but flavorful fruit. I will use the crust and filling for many other fruits. 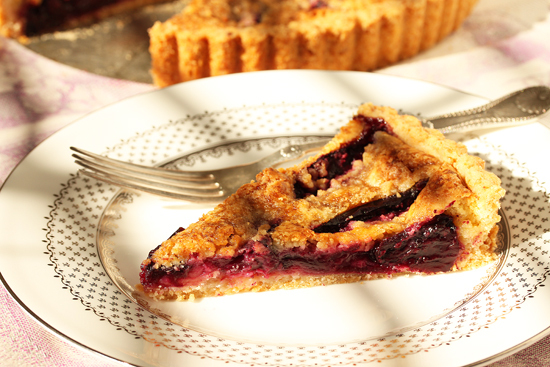 This is a fairly quick and easy tart that is beautiful and delicious. Thanks for sharing it. Can you use a pie plate for this? My daughter just peeled a bunch of pears and we don’t have a tart pan! just wanted to drop you a note to tell you how FABULOUS your plum kuchen recipe is — I made it this morning and think it is probably the best kuchen recipe I’ve tried. Thanks so much! I spent my childhood in Austria, and plum kuchen is a favorite late morning/mid-afternoon “snack” that everyone in Bavaria/southern Germany seems to have a slightly different recipe for. I’ve tried many recipes over time, and most American recipes frankly taste like “Bisquick”. Your is … divine. I used the left over whipped cream from the carton to whip up and put it on top … oh my. Fabulous! So now I’m going through the rest of your blog — I’m going to try the meatballs next. I most often use Marcella Hazan’s recipe, but am really game to try yours! I made this with blood plums – delicious! I especially liked the crisp base.